Batman has been a cultural phenomenon for nearly 80 years—since the superhero first appeared in the pages of DC Comics’ Detective Comics series in 1939. Over the years, he’s moved from comic books to the small screen to the big screen, attracting new generations of fans along the way. The Batman movies have grossed nearly 4 billion worldwide, making it one of the highest-grossing film franchises in history. No matter who wears the cape and cowl—whether it’s Adam West, George Clooney or Christian Bale—one thing remains constant: Fans can’t get enough of the Caped Crusader. 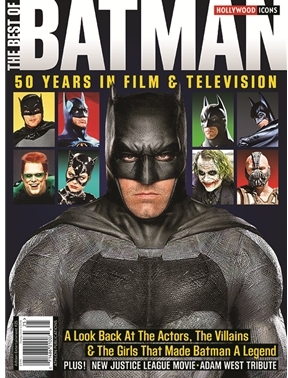 In this issue of The Best of Batman, our editors pay tribute to the Dark Knight, from his days as a comic book superhero to present day, as Ben Affleck emerges from the Batcave to star in “Justice League: Part One,” due in November. Holy ticket sales, Batman—it’s sure to be another blockbuster—and so is our newest special issue.